I spent more than my fair share of time this morning gazing admiringly at W’s January 2010 photo spread by photographer Craig McDean. So many silky, feminine looks. I’m looking forward to pulling out a few of the silk Mischen pieces I bought on Gilt come spring! – The blonde is her mom. Yup. – Hilary was wearing Stella McCartney. I knew you’d wanna know. – Hilary is at once totally normal-looking and intimidatingly model-perfect. It’s sort of weird. Just when you’re like, okay, she is like kind of normal-skinny and girl-from-Maryland, you snap a photo like the up-close one above and realize again why she is the face if Estee Lauder. She…is…gorgeous. – I want her eyebrows. Read an interview with Hilary Rhoda here, or check out the new Holiday 2009 issue in stores. Allison’s clothes are perfect. The kind of clothes that solve problems in your wardrobe and therefore, seemingly solve problems in your life. They’re actually eco-friendly too. The Spring line is somewhat vintage, forties-inspired (LOVE the cardigan-with-tulle-skirt outfit here). Join the lovely & fun Allison and her equally lovely & fun biz partner Marissa tomorrow eve for an intimate trunk show party. See you there? 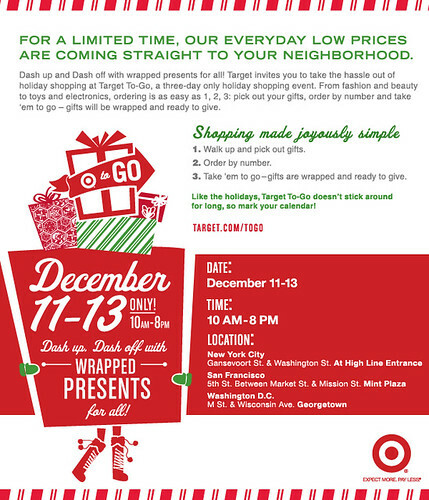 Target’s staging a holiday Target-To-Go walk-up shop in Georgetown this weekend, and while it takes more than a mass retailer launching an event in Washington to make me feel proud of DC’s coming-up-ness, I do think it’s pretty cool that this is only taking place here, in NYC, and San Francisco. This means that city-dwellers who can’t stomach the idea of trekking into the traffic Bermuda triangle that is the 14th Street big-box store explosion can….umm, trekk to Georgetown via the series of convoluted public transport available. That’s okay though – you have to admit that Georgetown is fun for shopping and people-watching and eating cupcakes. Among the limited amount of items available for this Target-To-Go thing? Pieces from Rodarte for Target, one week ahead the store debut (12/20). Not all of the items will be there, but the (I’m sorry, scary) ribcage dress, black halter dress, and those super-cute belts all will be. If you get there early enough!